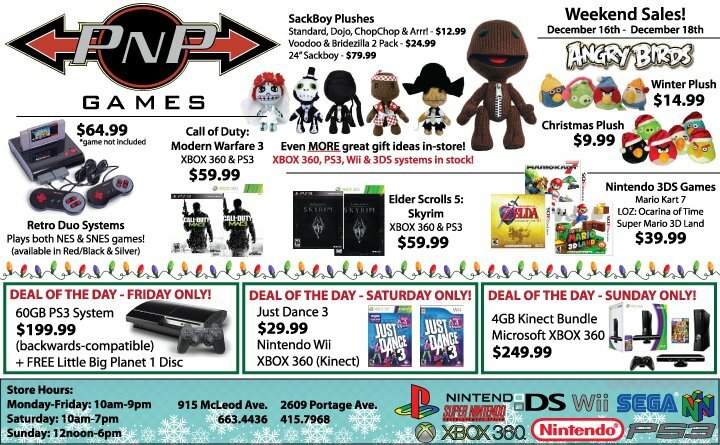 The deals continue this weekend at both PNP Games locations beginning today as we take $80 off the price of our refurbished 60GB PS3 systems and include a copy of the original LittleBigPlanet as well. Be aware, these are the fully backwards-compatible models that have the ability to play PlayStation 1, 2 and 3 games and, unlike some 80GB models, features the authentic Emotion Engine chip found in PS2 systems. This results in true PS2 playback without the use of emulation. This deal is only valid today (Friday, December 16th) so don’t miss out! For more details on our sales this weekend as well as a look at some of the other items we carry here in store, check out our latest flyer here or in either store via our handy QR code displays!